There is a lot of boat here. 'Kay Sera' was based on a Nicholsen Camper design, and built by a welder with exemplary attention to detail. It is easy to see the level of care that went into the construction of this yacht, the saloon is spacious with plenty of room to relax, the galley feels like an industrial kitchen, but looks modern and homely. There is full standing head room throughout for the taller sailer out there. As a capable offshore boat, deck layout is great with wide, flat open spaces and the cutter rig and set up makes her simple to sail short handed. The 38hp Yanmar has been regularly serviced by the owner, and is perfect for this type of heavy yacht, still able to push it at 6kts, and only uses around 4L of diesel per hour. The size and quality of 'Kay Sera' would suit a multitude of requirements, from coastal cruiser to blue water passagemaker to live aboard. The current owner is not using her, so she is now looking for a new owner. 38hp Yanmar. Raw water cooled, in great condition. Pushed around 6kts using 2-4L of diesel per hour. Gas 4 burner stove with griller and over. Plenty of cupboard space, stainless steel bench tops, sink, and 2x 24v compressor fridges. Two double beds with plenty of room. Enclosed standing shower. Hot and cold water. 12v digital TV, CD player. 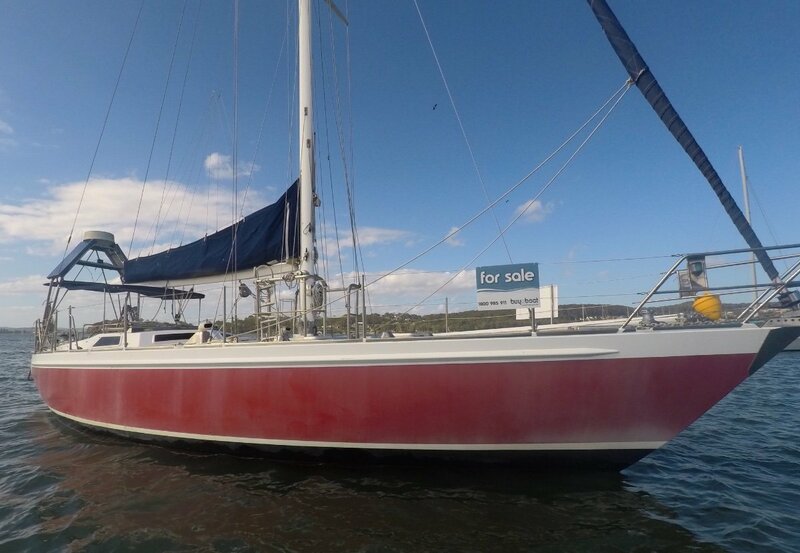 Bimini, clears, 5 years old in good condition. Heavy plough anchor with Hydraulic anchor winch. Life jackets, V sheet, life right, fire extinguisher, first aid kit, torch, fire blanket. 3x 90AH Batteries installed 2016,2x 80w solar panels. Radar, VHF, 27mhz, and autopilot (not currently working properly). 50% Main, 70% Head with new U-strip. Large, well constructed steel yacht that is of reputable design and well rigged. A capable boat that offers limitless opportunities to travel and explore. Lake Macquarie swing mooring included.